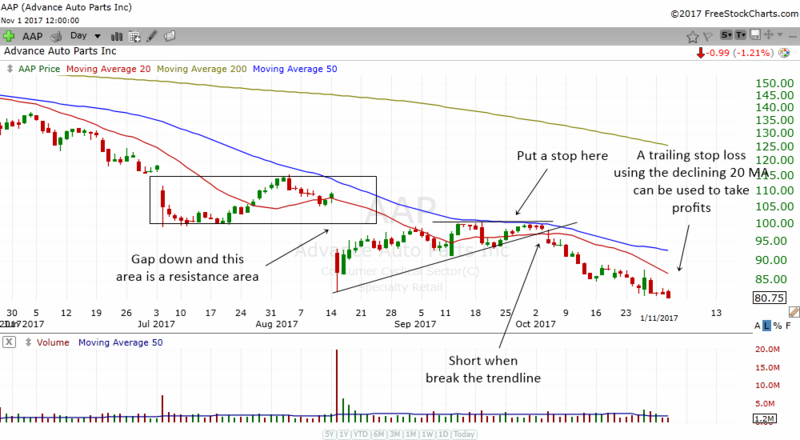 The break uptrendline at resistance chart pattern can be a very profitable trading strategy that captures a stock before it declines. This is a bearish continuation chart pattern that I have found to happen quite regularly in stocks. They can happen in almost any time frame but we will deal with it using the daily time frame. Once you have learned this chart pattern, you will no doubt be able to utilize it in other time frames as well. This chart pattern is made up of 2 very important technical analysis concepts. The first one is the resistance. Resistance is an area which keeps a stock from rising. Normally, a stock will move up to the resistance area and then break lower. Not all resistance areas will work but they work quite often to enable us to take advantage of this concept. The second one is trendlines. Trendlines are simple but effective tools to analyze stocks. You can often connect prices to form an uptrendline. When a stock breaks below an uptrendline, it can often go lower. When we combine these 2 technical analysis concepts, we can have a very potent trading strategy. 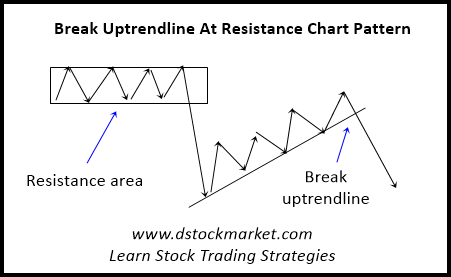 The chart above is what the "Break Uptrendline At Resistance Chart Pattern" looks like. We will first have a resistance area which usually consists of a congestion area or consolidation. Once the stock breaks below the congestion area, the area becomes a place of resistance which can often keep a stock from rising in the future. Not all stock swill drop and crash after they break down from the congestion area. Some will reverse direction and attempt to climb back up to the resistance area. This is where we can often draw an uptrendline connecting the lows of the price. When the stock reaches the resistance area and subsequently breaks below the uptrendline, it is a sign of a bearish continuation. We will take advantage of this and short the stock. Okay, let's take a look at a real live example of the theory. 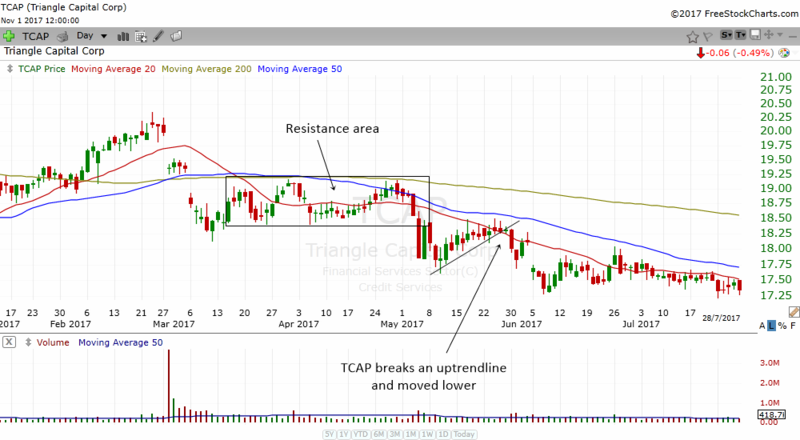 The chart above is the daily chart of TCAP. Notice how from March 2017 to May 2017 the stock had a consolidation. The stock then broke down below the consolidation but it did not drop a lot. It then attempted to climb back up. Some stocks do not drop immediately but they will be very stubborn and drift back higher. As the stock drifted higher, it eventually met the consolidation area which acted as a strong resistance. You can draw a very nice uptrendline across the prices. Once the stock break below the uptrendline, the stock continued to drop lower. The stock continued to drift lower as it is in a downtrend. That is the beauty of this chart pattern that I'm sharing with you. Not only does it capture the moment before the stock collapses, it also helps you to ride the trend. In essence this is a trend following strategy as well. Since we are using this chart pattern as a potential trading strategy, we need to have criterias. Criterias are important because they can help us to filter out the lousy candidates and also filter out candidates that won't give us the good risk reward that we want. Always remember that this trading strategy "Follows the trend". We are searching for a weak stock that is in a downtrend or drifting lower and we are going to short the rally. If you can find a stock that satisfies these 6 criterias, odds are the stock will continue to go lower and give you a nice risk to reward trade. Let's go through an example where I walk you through a stock that fits the criterias. The chart above is the daily chart of AAP. There is a resistance area (the box). The stock gap down and that will be the new resistance area. 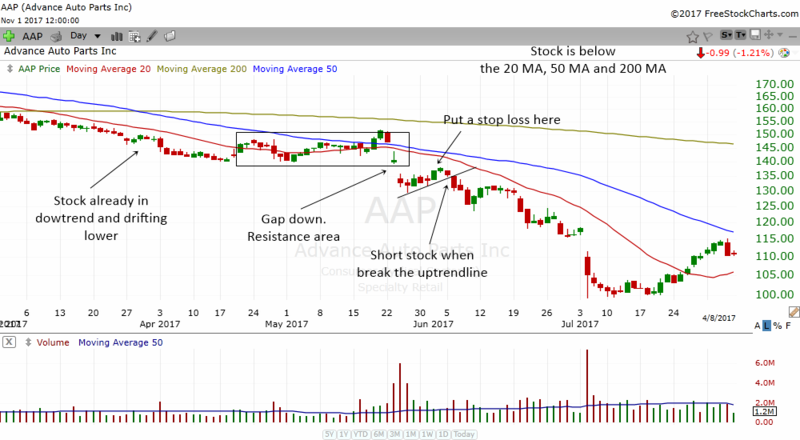 The chart of AAP is a very very good setup for the "Break Uptrendline At Resistance" trade. Notice how the stock went as low as $100 after the appearance of this pattern. By now I'm sure you will realize that this is a short selling trading strategy. What this means is we profit when the stock falls. In US, most stocks can be shorted so you can make money whether the stock goes up or goes down. The next thing you need to learn is how to put a stop loss. Obviously every trading strategy will have times when they do not work. Therefore, you should always have a protective stop so that the loss will not go on to be a big loss. If you take a look at the chart of AAP above, you will notice that I labeled the place where you should put the stop loss You can place a stop loss at the top of the uptrendline. Perhaps you can place the stop loss 0.10 or 0.20 above the top of the uptrendline. Once you have entered the stock and put your stop loss, it is time to think about when you want to take profits. Since this is a trend following trading strategy, I would advise you to take profits a little bit slower. How do you know the stock will move down lower and trend lower? Well, the selection criteria for this trading candidate is already very strict. We have in essence filtered stocks that are very weak and are likely to go lower, therefore you should have confidence to hold on to the position a bit longer. The chart above is the chart of AAP. Yes, it is the same AAP stock I have shown you above but we fast forward to another date. Notice how the stock keep on dropping and in early October 2017, the stock formed another setup. This time the uptrendline is a bit longer. There is also a gap down type of resistance area. The trader can short the stock when it breaks the uptrendline. Then we can put a stop loss at the top of the uptrendline. The stock is still declining and if you have taken this trade, you will not have closed it yet. How do you take the profit then? Well, you can use a trailing stop loss such as making use of the declining 20 MA. The 20 MA is the red line on the chart. You can take profits when the stock trades above the 20 MA decisively. That is just one way to take profits. There are other ways to take profits and I list some of them below. But as you gain more experience and more knowledge, you might be able to come up with other ways of taking profits that suit you. When you have a big reward in the trade, it is always a good idea to take some profits off the table and move your stop loss to breakeven which is the price that you enter. Suppose you risk $5000 on that trade and you are now making $10,000. It is a good idea to take 1/3 or 1/2 of your positions off the table and ride the other half down. You should also move your stop loss to breakeven. I'm going to show you another additional example here. As you go through more and more charts on your own, you will be able to spot this pattern easily. I recommend that you save the chart and annotate the chart with your observations. 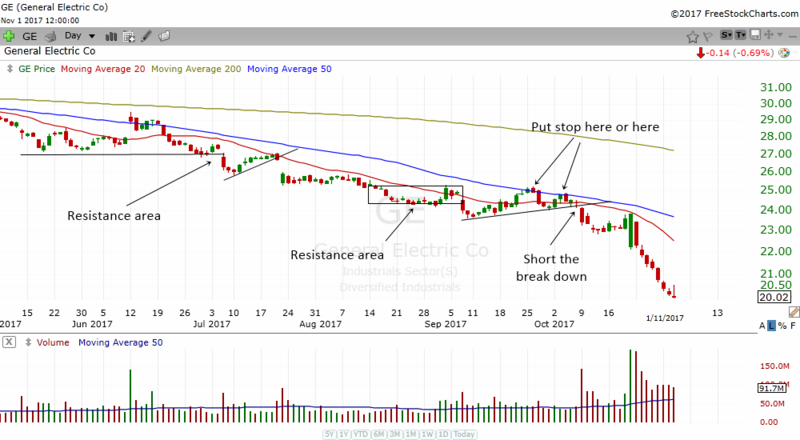 In the chart above, notice how GE was already in a downtrend. There are two break uptrendline at resistance patterns but I think the second one on the chart is more practical as the first one already gap down very low. The stock satisfies all the criteria that is need and when the second setup appeared, the trader can immediately short the stock when it breaks below the uptrendline. There are 2 places to put a stop loss, depending on how aggressive you are. I have pointed out the areas in the chart above. The wider the stop loss the lesser the reward but you might be able to avoid whipsaws. Notice how the stock continued to drop a lot after the setup appear. You have now learned a trading strategy that enables you to capture the stock before it breaks down. You have also learned a strategy that gives you a good risk reward on the trade as it is also a trend following trading strategy. Perhaps from now on you should look at stocks that are in a downtrend and see if you can spot the Break Uptrendline At Resistance chart pattern. Once you see this pattern, you can short the stock and profit from its decline.